Don’t get me wrong, I do love the Space Needle (it’s in my wedding photos! ), and it’s iconic and has a great view. It’s also gotten expensive and crowded and I think there are other places with better, or just as good views. I’d recommend going TO the Space Needle, just not up it, get some great photos of it from the ground while stopping at the nearby Chihuly Gardens and Glass Museum, the Museum of Pop Culture (MoPOP) and running through the International Fountain if it’s a hot day! 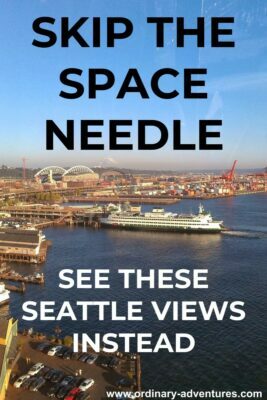 If you really need to experience the Space Needle’s new glass floor (no thanks!) then you do you. Otherwise, read on for the best Seattle views that are NOT at the Space Needle! The Smith Tower is my personal favorite Seattle view. It’s the perfect height (484 feet), high enough for a great view, but low enough you can still see lots of details on the ground. It’s also a historic building with lots of interesting and colorful history. 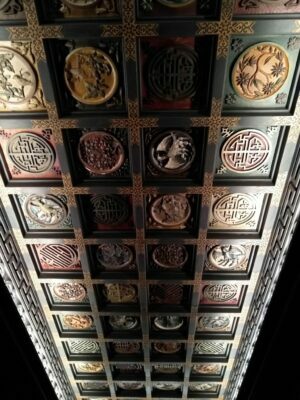 You ride in an old school elevator and go up to the observatory, which sports a prohibition themed bar and an exquisite carved ceiling. There are big windows, and you can also go outside and walk around (surrounded by metal safety bars). The view is amazing in all directions and they have good food! The Smith Tower costs $20, although you can go during happy hour (Monday-Thursday 4pm-6pm) for only $10 and after 9pm for $12. 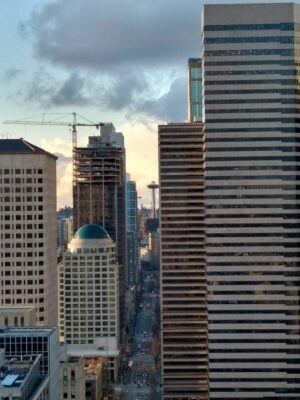 I especially love the view north directly up second avenue, where you can see the Space Needle between the buildings. 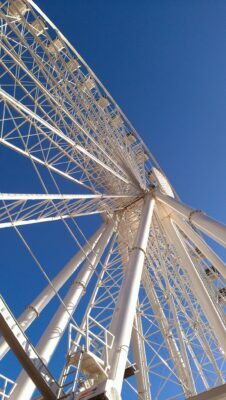 The Great Seattle Wheel is a relatively new addition to Seattle’s waterfront, but it’s fun and has a great view! It’s a very slow wheel, so it doesn’t feel like a ride where you’re going fast. Each car is enclosed and a lot of the time is part of loading and unloading, and it makes about four rotations as well. It provides especially good views of the waterfront. At 175 feet at the top, it’s low enough to feel like you’re still part of things (many downtown buildings are much higher) from a unique perspective for one of the best Seattle views. The wheel costs $14. At 76 stories and 900 feet, the Columbia Tower is the tallest building in Seattle and the Sky View Observatory on the 73rd floor is the highest viewpoint by far! Here you are high enough to see over pretty much everything else making the Seattle area look a little bit like a map, or like you’re landing in an airplane. It also has a bar and exhibits about what you are looking at in each direction. It costs $20. Riding the ferry from Seattle to Bainbridge Island (or Bremerton if you want a longer ride) is an activity not to be missed on a visit to Seattle and is definitely one of the best Seattle views! I do it all the time as a local too. At $8.50, the ferry is a very affordable way to see the city skyline from the unique vantage point of the water of Elliott Bay! You’ll also have great views of the Olympic Mountains. The ferry goes regularly and you can either get off and reboard again, or you can spend a bit of time wandering around the town of Winslow and having lunch or dinner before heading back to Seattle on a later ferry. Finally, I wanted to mention a completely FREE way to get the best Seattle views, at a couple of our city parks. Kerry Park on Queen Anne hill has an iconic and famous view of downtown and Mt Rainier (parking is nonexistent so take the bus!) and Hamilton Viewpoint Park provides a view from West Seattle. Both of these views are terrific! Wherever you go to check out views of Seattle’s unique skyline, enjoy! You can check out my other suggestions for spending a day in Seattle here.